As you can see from the simplified diagram below the facade pattern is one way to achieve this, it provides a unified class which reduces communication between the complex subsystem and its clients. Clients do not have to be aware of the actual implementation of the subsystem and are provided with a simpler interface to this subsystem. you want to provide a simple interface to a complex subsystem. The application of design patterns often results in a lot of small classes which makes subsystems more flexible and customizable. A facade can provide a default view for clients which don't need to customize. you want to reduce coupling between clients-subsystems or subsystems-subsystems. you want to layer your subsystems. 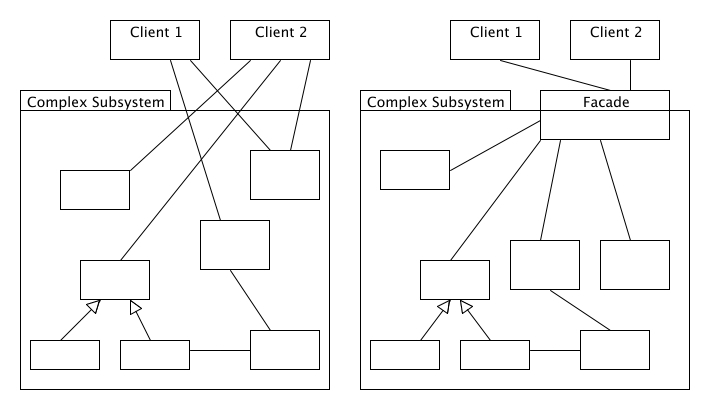 Use a facade to define an entry point to each subsystem level and make them communicate only through their facades, this can simplify the dependencies between them. Abstract Factory can be used with Facade to provide an interface for creating subsystem objects. Facades are often implemented as Singletons when only one facade per subsystem is needed/desired. Mediator is similar to Facade in that in abstracts functionality of existing classes. [GoF, "Design Patterns"]. 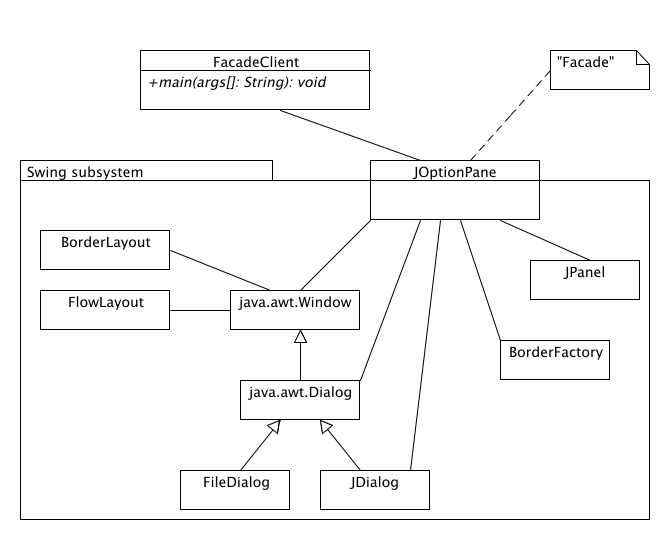 However while a Mediator centralizes functionality which doesn't belong in its colleague objects, a Facade does not define new functionality and the subsystems classes don't need to know anything about the facade object(s). Facade is very similar to Adapter, they are both wrappers and while you will often find facades wrapping multiple objects and adapters wrapping single objects, keep in mind this is not the difference between them. The sample code is based on the JavaWorld Article "Facade clears complexity", by David Geary, 05/30/03. We will be taking a look at the class javax.swing.JOptionPane, which is a Facade class, it provides a simple interface to different Dialogs (Confirm, Input, Message and OptionDialogs) of the Java Swing subsystem. 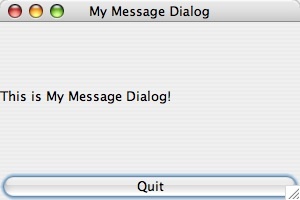 As you can see, the JOptionPane Facade in Java Swing provides an easy interface to programmers who simply want to create a pop-up Message Dialog.